The capability to deliver information instead of just data, and to do it in real-time, has significantly changed the whole data collection model. Have you ever seen the term “Information Anywhere” and wondered exactly what it means? We chose this terminology carefully, so it’s more than a mere tag line. Basically, the term refers to the capabilities we build into our HMI (Human Machine Interface) and visualization devices, otherwise known as Information Anywhere. For years, Parker talked to companies that wanted to collect data off the plant floor, even before Internet technology started to enter the industrial arena. Companies wanted to collect data about such-and-such processes. Or, they wanted to log into a database, grab production information and then run reports against it to improve their operations. However, in the past, the reality was that data resided in isolated siloes and very little of it was turned into information. A typical company stored data about how many parts production had run in one table in a database and more than likely it also had a target figure stored in another table in the database. Companies rarely ran queries and then pulled the reports together to actually show anyone what was going on so they could take action on it. They mostly just collected data and never turned it into useful information. The upshot was that in the past, reports lagged reality – that is, what’s happening on the floor in real time. Even when personnel took the time to compile the data they had been logging, they'd find out the overall performance on yesterday's shift or last month's combination of shifts. What they didn’t find out —right now, right where they were — was exactly what was going on with cell number one or line number three. So Parker decided to address this challenge. Fast-forward to the latest generation of tools that take data and make it available as information in real-time. For about five years now, Parker has provided a family of tools beginning with our HMI products. Users can take the scenes on the plant floor or customize the data for other audiences such as a supervisor or a plant manager who may want to see only plant production data. These products let customers create a private solution enabling them to view their process data internally on their Intranet or externally on the Internet. This approach lets users see information such as what's going on with a particular machine on any browser. Users can see current production relative to target production, literally adjust settings on the machine remotely and provide KPIs and metrics about what was happening on the floor. The capability to deliver information instead of just data, and to do it in real-time, has significantly changed the whole data collection model. As mentioned previously, the model was, "We're going to log it in one day, and then we're going to do something with it," and nobody ever had the time to get back to the data. But the capacity to access data in real-time on the HMI screen or remotely on a mobile device, such as an Android phone, Tablet or Apple IOS device, gives personnel information that lets them make adjustments mid-shift. So what we call the “Information Anywhere” revolution is delivering real-time information across standard web technologies so that you can correct processes in mid-shift, in real-time. 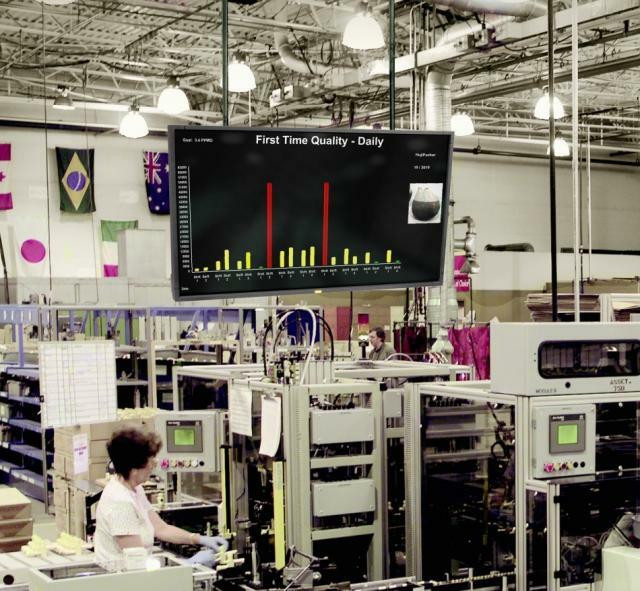 The Information Architecture capability is currently available in the HMI and production floor display devices and will shortly be available in the next-generation controller products.